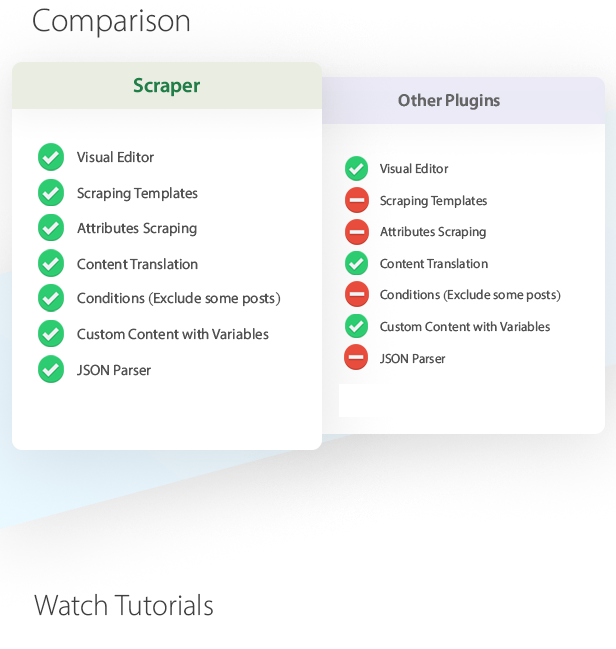 Scraper is an automatic plugin that copies content and posts automatically from any web site. With tons of useful and unique features, Scraper WordPress plugin takes content creating process to another level. 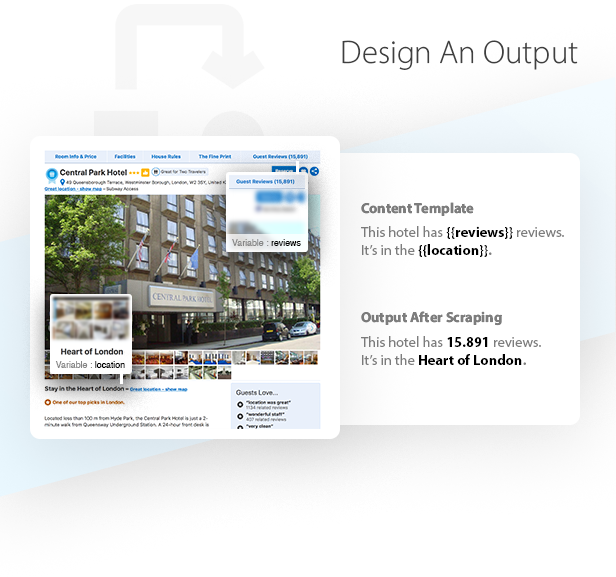 Design your own scraping method with visual editor, Scraper will automatically fetch and post 7/24 for you. We are creating step by step tutorials for plugin. Please let us know if you have any questions, we’ll be adding all details on tutorials. [+] How to setup proxy for scraping process? [+] How to create dynamic WordPress shortcode? NEW! [+] How to hide elements on visual editor? [+] How to embed any iframe video? + Clone task feature introduced. + product attributes issue has been fixed. + Split delimiter bug fixed for gallery images. + Disable URL parameters for URL uniqueness option. + Set featured image with post parent ID. + Total run limit functionality has been added. + Set author option has been added. + Set post slug option has been added. + Multiple p element issue has been fixed for post_content. + Page increase stuck issues has been fixed. + (Bugfix) Used images won't be downloaded again. + Next page jump and auto-reset functions has been improved. + WooCommerce product_cat and product_tag issues has been fixed. + Bulk list URL problems has been fixed. + URL path issues has been fixed. + Next page trigger functions has been updated. + Gallery selection issues has been fixed. + Visual selector has been improved. + Default value for product attributes has been updated. + Next page selector has been improved. + Article content selector has been improved. + cURL feature has been added. + Proxy issues has been fixed. + Visual editor zoom issue has been fixed for low resolutions. + product_tag creation issue has been fixed. + Same variable name issue has been fixed for visual editor. + Bulk URL list option added. + Yandex Translation API has been added. + tbody issue has been fixed for Chrome. + Post formats has been added on project settings. + Ajax request error has been updated. + Index selection issue has been fixed for complex tables. + New track option added : no change on post status. + Notices removed from settings area. + Pagination issues has been fixed. + Image download and is required issues has been fixed. + Memory issue has been fixed. + Aliexpress image issue has been fixed. + Error display added for timeout and memory issues. + Remove element for removing popups, preloaders. + "Required" field added. It pass if field is empty. + Special Conditions section added. + Task limit issue has been fixed. + Next page function on preview results. + Auto-detection for scraping feature has been added. + Using variables as shortcodes on WordPress is possible now! + Visual editor Scraping base URL problem fixed. + Proxy URL issue on Visual tool, fixed. + Excluding posts by attributes is possible now. + Detailed logs for issues, problems. + Connection test functionality added. + Extract ID, HTML or URL from image attachment. + Limit task trigger function. + Next page URL issues has been fixed for location redirections. + For is multiple field, JSON database format added. + Split content by words option added. + SKU Uniqueness method added. + _stock, _manage_stock, _backorders attributes has added. + Track changes function has been updated with uniquness method. + Post title can be used on filenames. + Post excerpt field added, it's also short product description. + Post delete issues has been fixed. + Post status change functionality added. + Visual editor's local copy is on plugin with latest version. + Long URL issues has been fixed. + Post uniqueness issue has been fixed for post updates. + Delete post with source URL changes feature added. + Task process delay added. + Stop task feature replaced with pause task. It continues from last index. + Bit.ly decode feature added. + Multiple custom field feature added. + Media library attachment problem fixed for image objects. + Some UI problems has been fixed. + Custom field issues has been fixed. + RSS feed or XML parsing method added. + Woocommerce product category issue fixed. On this section, we’ll be helping you about your concerns before you purchase. Your hosting or server should allow incoming and outgoing network transfers for scraping. Our support team can reach task’s content from service logs if you provide us any. This method makes easier support process and with this way our support team assist you quickly on any case. We’ll be updating plugin for any bug or features that requested by users. Every update has been tested by our support team and softwares. Plugin is licensed per domain. You should buy licence for each domain. You could move your licence to another domain. Scraper doesn’t support ajax websites because of technical limitations. Our plugin uses Google Translate official API unlike other plugins. So please make sure you have API key on that service before you purchase for translation services. Please also note that Google Translate’s Official API is a paid service. Scraper’s plugin has functions that scrapes elements from given URLs. Our visual editor is a cloud based editor that hosted by us on our web service. Plugin doesn’t contains visual editor’s files in it. It only gets JSON data that built on visual editor. Since Amazon blocked our servers, the plugin is unable to scrape any product from Amazon. That might be same for AliExpress and other big websites in future. Please make sure that plugin works properly before purchase. You could simply contact with our support team or comment and ask about support status. We’ll gladly test and inform you about changes. You could request refund on any case that you are not satisfied on plugin.